It's not uncommon to occasionally stumble across various mistakes and typos as you read a Three Investigators book. Incorrectly spelled words are easy to spot as are illustrations that don't match what is described in the text. But some mistakes, like continuity errors and inconsistencies in the stories, are difficult to catch unless one is really paying attention. For example, there are only thirteen plaster busts in "The Mystery of the Fiery Eye" but the attentive reader may note that the author gives them fourteen different names and even loses track of which ones have been sold! Unlike the publishers of many juvenile series books, Random House made every effort to correct errors when they were brought to their attention. Thus, it is more common to find errors in the earliest editions of a given title and even more so in the earliest printings. On the rear cover of any Random House hardcover trade edition which lists either four or six titles, "The Secret of Terror Castle" is incorrectly titled "The Mystery of Terror Castle". corrected in the next printing. this error was corrected in the Second Printing. sight anywhere." Of course, there should be no period between the words "road" and "without". paperback edition. It was finally corrected by Random House in the 1985 revised Keyhole paperback edition. and that he hung a similar painting in its place, after they fled, just in case they came back to look at it. that it's definitely a painted eye and not real, before they fled the castle. hand but the illustration shows it in his right hand. correct this error for the hardback and Windward editions. was corrected by Vebell for the Windward paperback which shows a yellow-headed parrot. Ed Vebell is incorrectly credited as the illustrator (though he did paint the cover). putting my name on the title page at least on an equal footing with the illustrator . . ."
STUTTERING PARROT. They look very nice with my name in them." razored out and replaced with a professionally tipped-in corrected title page. and Pete as described in the accompanying text. in this book, please visit this page of the site: Stuttering Parrot Sketch/Illustration Comparison Page. be a comma, not a period, between "Wilkins" and "Professor." spelled "Verdent". This error was corrected in all later paperback editions. Text Error: In the hardback trade edition, page 85, Bob's horse should be called "Rockingchair" not "Rockinghorse". the corrections for both of the above-mentioned text errrors in future printings. bottom, "Bob and Chang" should read "Pete and Chang". Text Error: In the hardback trade edition, page 89, final line of text, "Bob and Pete" should read "Jupiter and Pete". Augustus of Poland, Luther, Bismarck, Queen Victoria, Washington, Franklin (Ben), and Lincoln. On page 75 a lady wants to return two busts that she purchased, they are: Augustus of Poland and Francis Bacon (one of the five busts listed on page 45 that hadn't sold!). is clearly empty in the accompanying Kane illustration. his fellow Investigators when they explore the mansion. back . . ." but it should read "Two guards escorted Jupiter, Bob and Rudy back . . ."
in the next printing of this title. 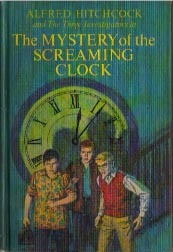 Cover Art: Harry Kane made an error on the clock dial found on the front cover which almost wasn't caught by the editors. not quite the same size as the other numbers. This is most likely where the error was made and corrected. mechanicals, but we never saw blues. In the future, it might be wise to see blues before the first proof." eliminate completely Jupiter's little brief case." 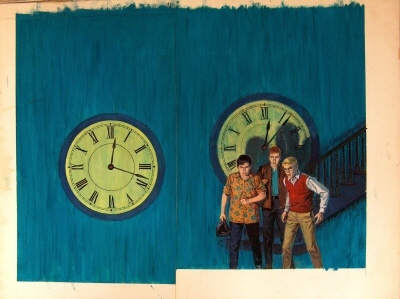 Harry Kane's original 1968 cover painting for "Screaming Clock". Collection of Seth T. Smolinske, 2004-2012, now residing in a private collection. 1888. The exception can be found in the 1978 Scholastic paperback where the year was changed to 1898. Typo: On page 157 of the hardback trade edition, third line from the bottom, "und" should be "and". Goldstein to have this error corrected in the next printing of the book. occurred on January 7, 1968, a few months before Robert Arthur began working on this book. shadow saw Bob and me last night." Please refer to chapter 8 of the book for verification. This error is found on page 95 of the Scholastic edition and page 80 of the Keyhole paperback edition. paperback editions shows Jupiter and Pete but it should be Bob and Pete. U.S. government makes only one standard size gold bar and it weighs approximately 27.5 pounds. This line is repeated again as the first line of text on page 68. Text Error: In the beginning of Chapter 11, seventh sentence, it should be Pete, not Bob, who says "Red Gate Rover?" This error appears to have not been corrected until the 1991 Bullseye paperback edition was published. Incorrect Fact: On pages 114/115 of the hardback trade and GLB edition, Jupiter suggests lighting a shack on fire to draw the police's attention, and it explodes because "Thurgood was keeping his dynamite in that shack." However, dynamite does not explode when set on fire; it requires a shock (such as that delivered by a blasting cap) to detonate. burning is actually a preferred method of disposing of old dynamite when you don't want to risk moving it. is oddly repeated from page 41: "All wet as usual," Skinny Norris called from the car. found in the GLB hardback, Keyhole paperback and Bullseye paperback editions and was never corrected. Incorrect Attribution: Illustrator Gonzalez Vicente's name is wrongly spelled "Vincente" in all U.S. copies of this title. incorrect, the correct page to turn to for this choice is 115. Oh my, this old scan is a bit muddy but you can see how the book cover turned out.